If you’ve had treatment from one of our physiotherapists, chances are you’ve probably had strapping tape used on you at some point. There are three main types of strapping tape: rigid, kinesiology and dynamic. 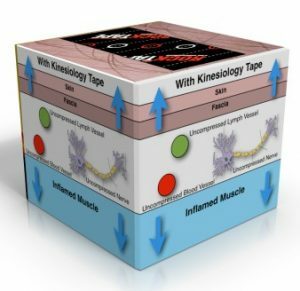 Today we will discuss Rocktape, Australia’s leading brand of kinesiology tape. 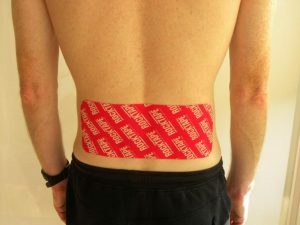 What Is Rocktape and How Does it Work? 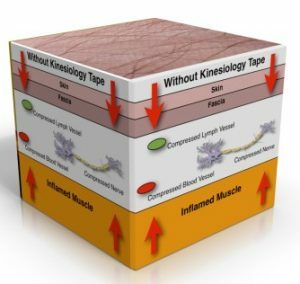 Kinesiology tape was originally developed by Dr Kenzo Kase in the 1970s. It is an elastic strapping tape that has the ability to stretch longitudinally (lengthways) but not transversely (horizontally). 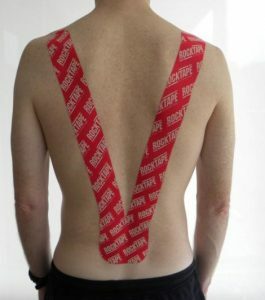 Rocktape was later developed in the USA by chiropractor Greg van den Dries, who wanted a stickier and stretchier product. Neurological effect – decreased pain and improved body awareness. Figure 1: Compressive forces on fascia, neurovascular bundle and muscle. Figure 2: Rocktape applied to reduce compression on fascia, lymphatic vessels and neurovascular bundle and muscle. The elasticity in the tape allows for a full range of motion, so it is very comfortable and doesn’t limit your movement. The tape can be worn for up to 5 days. Loss of muscle strength is limited by allowing and encouraging pain-free movement to occur. The tape encourages normal movement and therefore decreasing compensatory reactions. How Do You Apply Rocktape? Rocktape is made of 91% cotton, 3% nylon and an acrylic adhesive similar to a BandAid. It is 100% latex free. We encourage you to check with your physiotherapist on whether Rocktape may be able to help you. We can identify the best Rocktape application for you and show you how to apply it yourself in future. Click here to view a video showing these principles. When removing Rocktape, it is important to remove the tape slowly and in the direction of the hair. Rocktape comes off easily when wet and you can also use oil to help break down the adhesive. Below are some examples of Rocktape applications. Regional applications (on joints and muscles) of Rocktape can help to improve range of motion, decrease pain and improve muscle activity. Inflammation and oedema applications can improve fluid flow, reduce pain and improve range of motion. 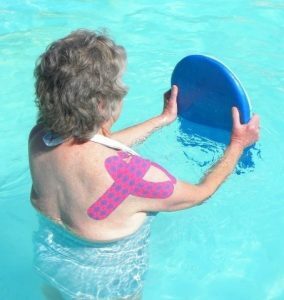 Postural taping applications can reduce pain, influence muscle activity and cue body position. You can find more information on Rocktape at www.rocktape.com.au. If you have any questions about the content in this post, don’t hesitate to contact us. This post was written by Lucy Beumer. Lucy is a sports physiotherapist and clinical Pilates instructor at Stafford Physiotherapy Centre. She is also a presenter for Rocktape Australia and has presented courses in Queensland and Darwin for the last 4 and a half years. She was not paid for this blog post. Discovering Rocktape was one of my better finds in life. Even use it sometimes instead of bandaids. I find less people know of it than more so to demonstrate its profile I liken it to what footy players wear when appearing strapped up on the field. Don’t know if that’s what their stuff really is but it gets my point across. Its application from fallen arches to wrist support to rotator cuff injuries is phenominal. Neither is it expensive given its range of application. And love the choice of designs! Brilliant!